Porcelain veneers are an excellent way to brighten your smile if your teeth are stained, chipped, irregularly shaped, gapped, or crooked. The application process is simple and can be completed in just two visits. 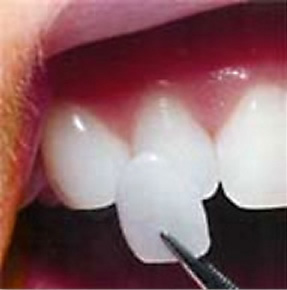 Porcelain veneers are very thin, half a millimeter thick, just about the thickness of a fingernail. The tooth may be shaved down slightly to make room for the porcelain, but in some cases this may not be necessary. Not only is porcelain the most closely looking restorative material to a natural tooth, it is highly resistant to stains. It is harder than your normal tooth enamel so it can last for many years to come. This photo demonstrates just how thin porcelain veneers really are. Very little has been removed from the underlying tooth. Since it truly is a form of artistry, this procedure should be undertaken by an experienced cosmetic dentist. Our dentists skillfully craft a new smile for you as white as you would like. The result will look so natural, no one will know that you are wearing porcelain veneers. During our initial consult, the dentist will meet with you to discuss exactly how you want your smile to look. Colors, shading, and facial characteristics are all important factors that can make a significant impact on your smile. Next, it is time to begin the design process where we will take photos of your teeth and collect diagnostic information so your veneers are a perfect match. At the next appointment, an impression is taken so the ceramist can customize the veneers to meet your specific tooth characteristics. If there is any tooth preparation required, this is when it will be done. Temporary veneers, if they are needed, will be provided for you to wear until the porcelain veneers are completed. If there is no tooth preparation required for your case, temporary veneers will not be needed. When they are ready to be placed, our dentist will fit them over your teeth. During this step, you will be able to see the look of the new veneers to make sure you are absolutely satisfied before they are bonded to the teeth. Once the bonding is complete, you are ready to show off you new smile! To find out more about veneers and other cosmetic dentistry techniques or to schedule a free 15-minute consultation, call us today.